All Three Workshops were Great! Saturday we had a class of 13 for into to acting. Age ranges from 14 to 74. Great group and they all gave Micki great grades. Saturday afternoon we had 15 aspiring screenwriters. Sunday we had 11 participants for writing with the actor in mind. Acting class going through the paces. Everyone is invited to a Wine, Cheese and Sparking Cider to welcome Micki Selvitella to Harney County. Lorna Cagle is hosting the event at her home at 399 N Koa St in Burns on Friday March 22nd from 5:00 to 6:30 PM. You don't have to attend the workshops to come. Besides writing, publishing and doing my own workshops, I help our local Writers Guild bring outside talent to Harney County to help develop and encourage the blossoming artists, actors and writers here. I met Micki Selvitella at the 2011 Willamette Writers conference when she directed my ten minute screen play of Designer Detective that was selected for Actors Lab on the Friday night of the conference. She is a delight to work with and we've been able to engage her to come to Harney County to teach three workshops. An introduction to the basics of Western (Stanislavsky) acting, including movement, voice and diction, making choices, action, stage directions and use of space. For the beginning student, techniques of confronting and overcoming personal inhibitions will be stressed. For more advanced students or professionals, there will be opportunities to explore deeper levels of technique. Exercises will include a Personal Monologue derived and performed in class, Blank Scenes and partner work, and working with props. Students are encouraged to wear clothing and footwear they are comfortable moving in. All students will be expected to participate, not just observe. Suitable for writers and actors alike of all levels. Workshop time: Saturday, March 23, 9 AM to Noon. Harney County Courthouse Basement Conference Room. What differentiates a screenplay from a stage play or novel? While they certainly share elements like characters and narrative, a movie script relies heavily on visuals, action and compression of time. We'll look at basic story and three-act structure, character development, dialogue and subtext. Discussions about loglines, synopses, treatments, professional standards in screenwriting software, formatting, and all those little pitfalls that can make your script look amateurish. Exercises in distilling your story down to its most basic elements, writing loglines, and genre. Though not required, students are encouraged to bring 2-3 page samples of their own scripts to be read and critiqued in class. Please bring enough copies for yourself and each of your characters. Appropriate for writers and enthusiasts in any genre. Workshop time: Saturday, March 23, 1:30 to 4:30 PM, Harney County Courthouse Basement Conference Room. As screenwriters and playwrights, our words have to be read aloud. Learn more about the actor’s job in order to craft great, believable dialogue that will make your words sing and the actor’s performance shine. An introduction to how actors think, look at scripts, and develop characters. We’ll also look at the casting process, why it’s important to have readings of your work, and working with directors to make sure they understand the needs of your script. Participants are encouraged to bring samples from their scripts to “test drive” them in class. Suitable for writers of dialogue from all levels and genres. Sunday, March 24, 1 to 4 PM, Harney County Courthouse Basement Conference Room. The Writer’s Guild of Harney County is pleased to announce that Portland Screenwriter, Actor and Director Micki Selvitella will be conducting writing and acting workshops in the weekend of March 22, 23 and 24, 2013 in Burns, Oregon. Selvitella is an interdisciplinary artist with a long career in Film, Theatre, Music, Languages, and the Visual Arts. She will be teaching three 3-hour long workshops: “Introduction to Acting”, “Screenwriting Basics”, and her signature course which synthesizes both writing and performing, “Writing with the Actor in Mind”. She welcomes beginners and advanced writers and performers alike to participate. She is the Writer/Director of the web series "F22", which shot in Boston. She just completed writing her 6th screenplay, and is co-writing a script for the Chinese film market called “Eye of the Wind” with Miami screenwriter Doug Shear. 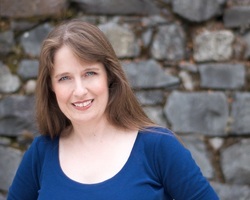 Making her home in Portland, Oregon, Micki has a busy acting and teaching schedule. She held posts at several regional theaters and universities around the country, including Education Director at Portland Center Stage, Interim Director of Opera Theatre at Northern Arizona University in Flagstaff, and Director of the Theatre Department at Pacific University in Forest Grove, OR. She is also the former Artistic Director of Pittsburgh New Voices, a professional theatre company in Pennsylvania, which focused on producing the works of writers from all genres. Delving into Portland’s rich independent film community, Micki is gearing up to write and direct a short film which will shoot in January. It will be produced by frequent collaborator and cinematographer, Teja Arboleda, Creative Director of Entertaining Diversity. A native Bostonian, Micki began performing at an early age, and went on to major in theatre and music at Clark University in Worcester, Massachusetts. She completed the Graduate Technical Certificate program at the Yale School of Drama in Lighting and Electricity, and holds a Masters of Fine Arts degree in Theatrical Directing from Ohio University in Athens, OH. Having spent her junior year at the University of Sussex in Brighton, England, Micki has sought out every opportunity to work and travel abroad. She is a Fulbright scholar, receiving a Senior Lecturing Fellowship to teach theatre history and directing at Taiwan’s prestigious National Taiwan University in Taipei. During that time, she traveled solo to Mainland China to study and observe classical forms of Chinese theatre and dance. On this side of the Pacific, she is the recipient of an SDC Observership (Seattle) through the theatrical director’s union. As an actress, Micki most recently starred in Travis Ezell’s short film “The World of Missing Persons”. As a voice-over artist, she has featured roles in Brie Williams’ soon-to-be-released podcast “The Polygamonsters”, and “Let Yourself Be Loved” from Dreams Landing. She is a member and frequent contributor to the Directors Lab West (Los Angeles), and Willamette Writers (Portland). More information about her can be found at www.mickiselvitella.com. The Bird-Song Fest was a great hit. About 50 people attended at the Showtime Bar and Grill. We wore funny hats to get into the mood, sang songs about birds, and others. Some of the Old Tyme Fiddlers joined us. Amazing hidden talent emerged. This was another fund raiser to bring Micki to Harney County. Reading at the library. Photo courtesy of Kate Marsh. 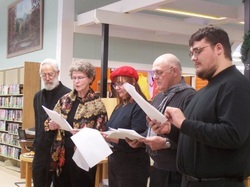 The Writers Guild of Harney County held a Reader Theater on Saturday, January 5, and featured the works of local and guest writers. It was presented in two venues. First was an afternoon performance from 4:00 to 5:00 p.m. at the Harney County Library. Thank you, Barbara, for staying late to keep the library open for us. The second presentation was a Dinner Theater at Rhojo's Restaurant. Tickets included a spaghetti and salad dinner with dessert and a no-host wine and beer bar. The theater was well-received by both audiences, and we hope to do another Reader Theater in the summer. The playbill featured Carseat Conversations, a short screenplay by Portland screenwriter, Micki Selvitella. Also read were ten minute selections from Alistair Coronet, a novel-in-progress by Jordan Wallis, Designer Detective, a screenplay from the novel by Marjorie Thelen, and Twelve Days One Christmas, a script-in-progress by Peg Wallis. Reader’s Theater is an art form combining actors’ talents with the fun of reading aloud. Minimal props are used to suggest character and setting. Proceeds from the event will help bring Micki Selvitella to Burns. Participating actors included John Thelen, Marjorie Thelen, Peg Wallis, Tom Wallis, Jordie Wallis and Kate Marsh, all of Burns.